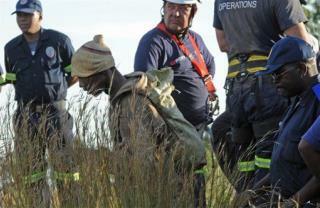 (Newser) – About a dozen miners have been freed from a mine in South Africa since getting trapped there yesterday, but others are refusing to emerge because they don't want to be arrested for illegal mining, Reuters and CNN report. One miner is trying to convince about 19 others to surface, but rescuers have given up trying to help for now. Only police and mine security officials are staying behind. Those who have come up were given quick medical checks (no injuries so far, officials said) and taken into police custody. so just put the rock back! end of story! "Buried" in this story are some facts the media ignores. The Chinese are importing 1000 metric tons of gold per year as is Russia. This is in preparation of the coming global currency reset. Educate yourself if you don't know what a reset is. "Rescuers have giving up helping for now" in other words "fuc'em leave them down there and lets get a beer! "